This antenna can be installed on all DSE transmitters and receivers with both analogue or digital transmission at 2.4 GHz (SMA connector) and delivers a gain of 6 dB, instead of 3dB as the standard antennas. Unlike directional antennas (see below), this model does not transmit in a specific direction but in any direction (360°), like the standard antenna supplied. RE-AN3A is less powerful than a directional antenna, but without the limitation of transmitting in a single direction. This is an ideal way of increasing the range of radio transmitters in applications where it is impossible to use a directional antenna for example when more the one receiver are used. Like RE-CA1 length 1 m.
Almost all DSE devices, including cameras, transmitters, receivers, etc, take a 12V DC power supply. As well as being safer this means that the devices can also be battery powered. RE-PS35 is a battery pack which delivers 3.5Ah at 12VDC, and can be used with all DSE products. It can be used as the only source of power, for example with portable systems, or as a back-up power supply in the event of a power cut. It has a 12 VDC output jack which connects to the device, and an input for connecting the 220VAC/12VDC power adaptor (supplied) used for recharging. The battery pack can be used to power a device until it runs out of power, and then be connected to the power adaptor and recharged, or the battery unit can be connected between the mains power and the device, to ensure a power supply only in the event of a power cut. It recharges automatically when the mains power returns. Battery pack RE-PS35 has been specifically designed to be as light and compact as possible, while offering long run-time. The product comes complete with power adaptor for connecting to the mains, with a LED indicator for charging status. If you need to power more than once device you can purchase a power splitter for the output in the connectors section. 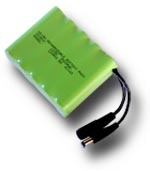 This battery pack has been specifically designed for portable applications. Using new generation lithium batteries this unit provides high capacity (6,9 Ah) in a very compact size (103x75x23 mm. and just 290 g). As well as the 12VDC output, which can power up any DSE equipment, there is also a 5VDC output which is used for some DSE products, such as the wearable camera RE-TCN9XH. The two power outputs can also be used simultaneously. The container has an ON/OFF switch and LED charging status indicator. The maximum load to be powered is 450mA for the 12VDC output and 1000 mA for the 5VDC output. 12V/510 mA .. 225 min. 5V/700 mA .. 470 min. 12V/80 mA + 5V/500 mA .. 355 min. The battery takes around 12 hours to recharge fully. The product includes: 12VDC output cable (5.5 mm plug), 5VDC output cable (3 mm plug), 220VAC/8.5VDC power adaptor.